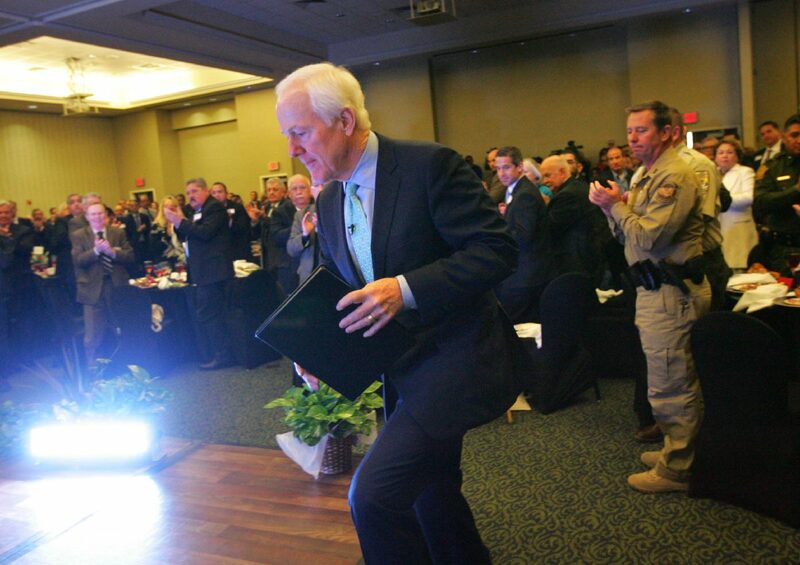 Sen. John Cornyn walks to the stage to deliver a state of Congress address to area leaders Friday, Jan. 12, 2018, at the Knapp Conference Center in Weslaco. 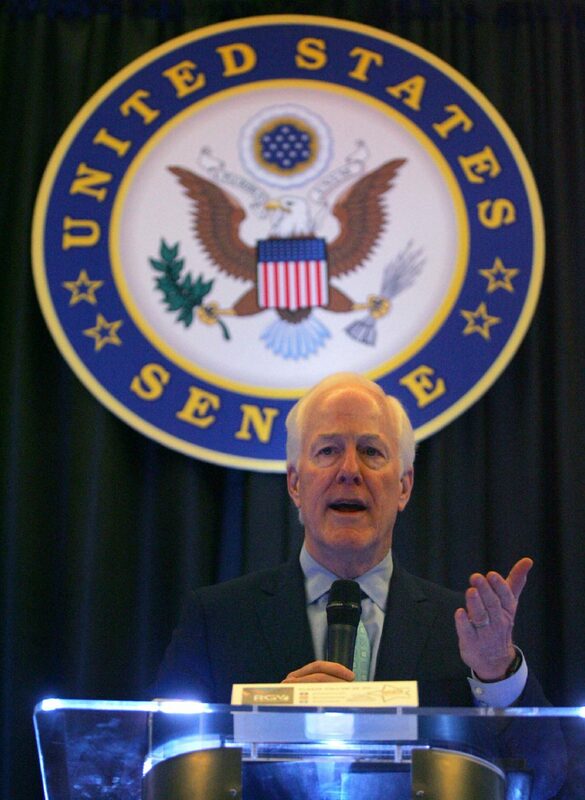 WESLACO — Sen. John Cornyn both criticized and praised President Donald Trump while talking trade, the border wall, the Deferred Action for Childhood Arrivals program and the recently passed tax-overhaul bill during a State of the Congress address here Friday. The current state of the North American Free Trade Agreement renegotiation, the Senate Majority Whip said, has him uneasy. Cornyn is also skeptical about elements of the proposed border wall, questioning parts of Trump’s $18 billion price tag. More optimistically, Cornyn lauded the recent passage of the tax-overhaul bill, which he said will bring 77,000 new jobs to Texas. And despite Trump saying this week that immigrants from El Salvador, Haiti and Africa descended from “s—hole countries,” according to news reports, Cornyn was confident lawmakers will soon find a DACA solution. But he enjoyed leaving Washington for Texas for the weekend, starting with a full day in the Rio Grande Valley Friday. U.S. Senator John Cornyn delivers a state of Congress address to area leaders Friday, January 12, 2018 at the Knapp Conference Center in Weslaco. Border Patrol RGV Sector Chief Manuel Padilla and a handful of local officials briefed Cornyn at the Santa Ana Wildlife Refuge, which the senior senator did not publicize. Cornyn and the officials met in a conference room tucked in a hallway inside the refuge’s visitor’s center. Santa Ana workers said they were not made aware of any visit until officials showed up Friday afternoon. The current proposed border wall would cross 3 miles through the beginning of the refuge and likely cut off much of its more than 2,000 acres. Darling said the consensus was that the refuge would likely be best served if security was ensured but a wall intersecting the property would probably not be best. Cornyn posted an Instagram video Friday afternoon from atop the observation tower, which would not be accessible if the proposed wall is built. While he agreed with Trump that physical barriers are important in some areas along the border, technology and personnel are necessary as well. He also noted the care needed for the habitat and wildlife at the refuge.